KOKOMO, Ind. – Three years ago, Walter Cross Field was the home of a history-making moment when the Kokomo Wildkats won its first sectional championship in 30 years. Last Friday night, the stadium witnessed another long streak that came to an end as Harrison won its first sectional championship since 1994. In the process of Harrison’s 19-16 win, the Kokomo Wildkats also saw its three-year stranglehold on the Class 5A Sectional 11 trophy come to an end. “Harrison made the plays they needed to make and we did not,” said first-year Kokomo head coach Richard Benberry. After starting the season 0-5, Kokomo entered the contest on a five-game win streak and plenty of momentum thanks to a victory over Harrison the previous month and a sectional opening upset of No. 10 McCutcheon. Much of the improvement came at the hands of the running game and the midseason arrival of Jeremy Baker, who rattled off four 100-yard rushing games during the win streak. But on this night, the game started on a sour note and end on a worse one. On the Wildkats seventh play from scrimmage, and already trailing 7-0, Baker got his lower leg tangled with a pair of Raider defenders and came limping off the field. The 6-foot-2, 182-pound junior runner spent the rest of the first half and much of the third quarter trying to get back in the game. Meanwhile, the Kats running game came to a screeching halt, which in turn allowed Harrison to key on the passing game. Harrison (6-5) took the opening kickoff and drove 62 yards on four plays – the drive was capped by a Steve Coffing 10-yard touchdown run. Kokomo scored on the drive Baker was hurt on, courtesy of an Anjelo Flores 20-yard field goal. The Kats took a 10-7 lead after Kohl Beard picked off Andrew Jensen and returned it 47 yards into the red zone. Following a Levi Hrabos to Brady Wiese 12-yard completion, Hrabos called his own number for a quarterback back sneak into the end zone late in the first quarter. Both squads’ defenses then took over, forcing the two North Central Conference foes into a punting battle and a 10-7 halftime score. Kokomo took the second half kickoff and had little success. Hrabos, also the Kats punter, then faced a stiff rush, which resulted in a rushed punt that covered just nine-yards. Six plays later, Harrison tied the game on a 27-yard field goal by Brian Pennell. Following more stellar defense resulting in both teams punting, Harrison took a 17-10 lead with 5:18 left. After a nice punt by Hrabos was fair caught at the Raiders 19, Jensen led Harrison on an 11 play, 81-yard drive that culminated in a Jensen to Jake Smith four-yard score. But Kokomo was not ready to give up and the Kats found their way into the end zone 17 seconds later. After a horrible Harrison kickoff that placed the ball at the Kokomo 41, Hrabos hit Noah Cameron on a seven-yard strike; but instead of going down, Cameron hit a streaking Steven Edwards on a hook-and-ladder. Edwards then fumbled the ball forward, caught the ball while still in mid-stride, and raced 50 yards before being forced out of bounds at the two. On the next play, Baker spun his way into the end zone to trim the lead to 17-16. But the snap for the point after was off mark and the holder could not get the ball down for the extra point, resulting in the Kats down one point with 5:01 remaining. Kokomo’s defense then held strong, forcing Harrison to punt for the fourth time in the game. Steven Edwards took the punt 17-yards to the Kokomo 31 with 2:38 remaining. But as he was tackled out of bounds, Kokomo was flagged for a 15-yard unsportsmanlike penalty, apparently on a Wildkat on the sidelines who was not involved in the play. That immediately shifted the momentum from Kokomo to Harrison as the defense sacked Hrabos on the first play for a 13-yard loss, placing the ball second-and-23 at the three-yard line. Hrabos then went long twice, missing Edwards both times. He was then sacked for a fifth time, this time resulting in a safety. Kokomo could not recover the on-side kick and Harrison ran out the clock and ran onto the field to grab its long-awaited sectional trophy. Hrabos finished the contest 16-28-0 for 208 yards. Wiese had four catches for 53 yards and Edwards caught three for 72 yards. The Kats running game, with Baker injured, finished with just one-yard rushing. 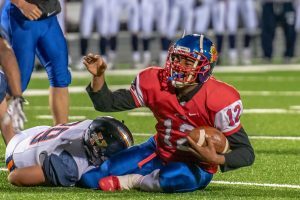 The defense was stellar for Kokomo as it held Harrison to 209 total yards – All-State candidate Javias Gray ended his career with nine tackles (two for a loss) and Jabrian Adams added seven tackles. Despite the 5-6, Kokomo showed vast improvements as it switched from a run-first offense to a spread offense. That allowed Hrabos to set Kokomo single-season records in pass attempts (269), pass completions (135), passing yards (2,037) and tie the record for touchdowns (17). He also became the first Kokomo quarterback to ever average more than 200 yards per game passing, finishing at 203.7. Edwards finished with a single-season records for receiving yards (996), receptions (47) and touchdowns (9). This entry was posted in IHSAA, Kokomo. Bookmark the permalink.